Potato podimas is a quick and easy side dish made with mashed potatoes. It is served as an accompaniment with rice. I love it with rasam and sambar sadam. 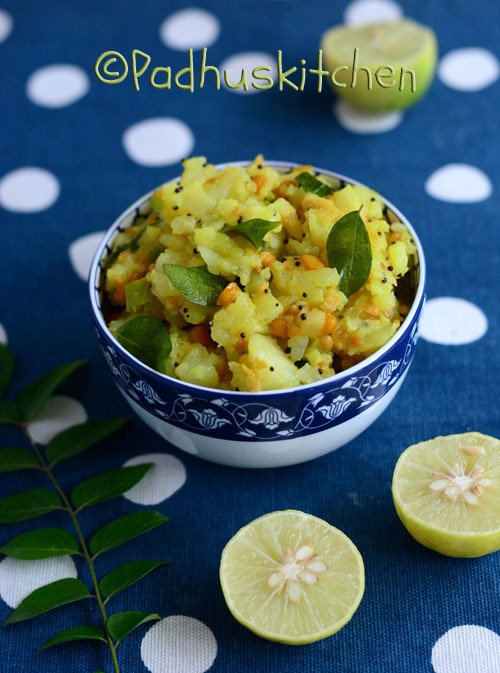 Learn to make potato (aloo in Hindi and Urulai kilagu in Tamil) podimas following this easy recipe with step wise pictures. Pressure cook potatoes until soft. Peel the skin and crumble it. Keep it aside. Heat oil in a pan, add mustard seeds, when it splutters, add urad dal, bengal gram (chana dal) and saute until dal turns light golden brown. Add ginger, green chilli, turmeric powder and curry leaves. Saute for a few seconds, add crumbled potatoes and salt needed. Mix well and turn off the heat. Squeeze juice of a fresh lemon and mix well. Garnish with finely chopped coriander leaves and enjoy. Potato Podimas is a quite new recipe to me. Adding lemon juice at the end gives a vibrant taste to the recipe. Loved it ! nice recipe .Almost all recipes became easy for me because of your blog.Thanks padhu.